This site is dedicated to the the people who have loved and cared for the Salt Fork River through the ages. I grew up in a little village by the name of Saint Joseph, Illinois. As a child growing up I would ride over this river in the back of my parents' car, gazing at it with a longing that only a child can comprehend. As soon as I was old enough I would ride my bike down to the muddy banks and play there all day. It was everything to me in my youth. It was where I could escape and let my imagination run wild. As I grew older it was where I could run to explore the beginnings of my rebellious adolesence without watchful eyes. I have had the fortune of being born to a wonderful family who stressed the importance of having a strong relationship with the outdoors. For as long as I can recall, my parents took my brother and me on trips down the river. Being in a canoe floating down the water with my uncles, aunts, cousins, grandparents, brother, friends, and parents were some of the best days of my life. The river made a immense impact on me as a child. It helped define the adult I am today. I am still obsessed with the river. It has helped forge great friendships that will last forever, and has also taken a part in driving some friends away from me. 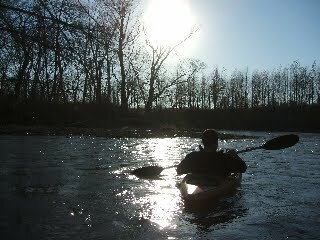 I spend many weekends on the river, and many hours that I should be at home with my family. Luckily, I have a wonderful wife who shares me with my river mistress. Without the understanding and support of my friends and family I could not live out my dreams on this river. Someday I plan to follow the river to its end in the Gulf. As of now I have made it to Cave-in-Rock, IL on the Ohio River. I know I am not the only one this river has touched. This site will hopefully bring likeminded people together, and the section guides will help make the river more accessible to more people in the future. My wife and my mother and father for their unending patience and love, as well as all the rides, pick ups, and ridiculous demands I have put them through.